I am trying to define a constrain which involves the following multiplication x’*x. However, it give me error message. Please show the entire constraint, along with all CVX variable declarations and the values of any MATLAB variables which may appear. The below picture shows my objective func and constrains. X is a matrics of size (2xN) yi is a (2x1) scalar vector. I defined the objective function without a problem. But I faced issue with defining the constrain hij. Please show us your formulation. You should be writing (16) as [eye(2) X;X' Z] == semidefinite(N+2) (or [eye(2) X;X' Z] >= 0 if using sdp mode). You should NOT be using the equivalent by Schur Complement Z - X'*X == semidefinite(N) (or Z - X'*X >= 0 if using semidefinite mode). You should not have Z == X'*X or Z = X'*X anywhere in the code. 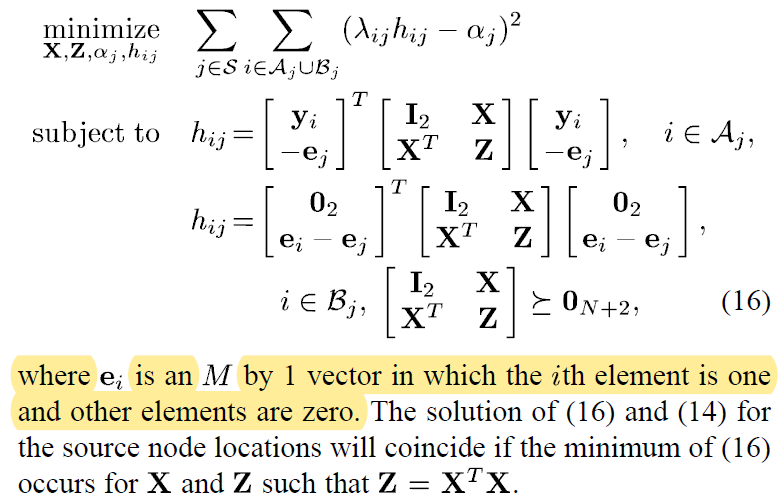 Constraint (16) is a convex semidefinite relaxation of Z == X'*X, and per the last sentence in the posted image, I guess you have to hope that the optimal solution of the relaxation formulation happens to satisfy Z = X'X (i.e., Z is rank one) at the optimal returned X. However, maybe the solver has finished “solving” the problem and determined that is is infeasible?. Please show all solver and CVX output. If you provide a reproducible problem, complete with all input data, perhaps someone can help you. if you post something, use the Prepormatted text icon, copy and paste it into a new MATLAB session, and verify that the output matches what you have shown. Your MATLAB session might be corrupted. Try running this is a new MATLAB session. If that doesn’t succeed, try reinstalling CVX. I actually duplicated your error when I ran it in an old session of MATLAB. But it ran successfully under 3 different solvers when I ran it in a new MATLAB session. I don’t know what kind of “corruption” is occurring, and whether it is due to a CVX bug. I am greatly thankful for your continued support. I reinstalled CVX .Now it is working fine. No words to thank you.